Wow, I haven't done a personal blog post in a very long time. It's probably because I have NO-Extra-TIME, running a photography business and being a new mom. It feels good to sit down on my couch and reflect, so thank you for anyone that is reading this. It was hard for me to adjust to motherhood. I went back to work in 2 weeks, crazy, right? I didn't get my rhythm / balance for a whole year. For so long, before mommy-hood, it's just been go go go, hustle hustle and relax and enjoy life along the way. Things change when you have a baby that depends on you. 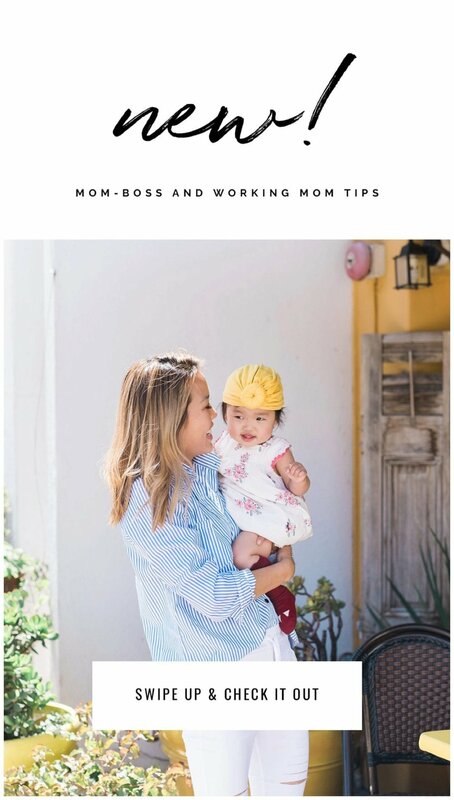 Here are some things that I have found helpful being a boss-mom. I'm interested to know any boss-mom life hacks that you know of. Thank you for your input. I've had to learn how to say "no", "no" to lunches during the day, workshops, hanging with friends. It was very hard for me but I need that time to rest, stay home and relax. Now when I say "YES", it's that much more fun and exciting! This goes along with saying "no" to clients you don't mesh with or jobs that aren't exciting for you. I've heard people talking about having too many obligations on their social calendar and my advice to them is to ask yourself one question "Do you want to be there?" The question is so simple yet it's a good question to think about and sometimes hard to answer. Is the person you are hanging out with going to lift you up? Is going to this event going to make you too tired for the next day? Are you doing too much? Plan your schedule at least a week in advance and cut out what is unnecessary. I've always been carefree and not the most organized person. After being a mother, I got a little OCD. Can anyone relate? I would be in my house and just see STUFF. It drove me crazy to the point where I didn't want to be in my own home. I hired a professional organizer to help me down-size my "stuff". Now everything has a home and it must go back to it's home everyday. I up-keep the home and it gives me a sense of peace. I will write a blog post about this. Take a moment of silence to just be still and have your mind rest. 10 minutes can go a long way. Like many new moms, I struggled with postpartum after having a baby. I sometimes felt empty and I was hyper sensitive. Having a child has truly made me a stronger person and I strive to always me in a positive/happy mood, send positive vibes to my clients and people around me. After practicing this, it's hard to get me down. Sometimes I feel like my efforts and hard work is wasted time but "knowing my why" helps. I work hard for my family and know that I'm fulfilling my passion and dream as a recognized wedding photographer and educator. This goes with "saying no". Rest is something I didn't know how to do before, and it was fine before having a kid. On my days off, I would schedule every hour to hang out with friends, go to a brewery, make a play-date. It was overwhelming. Now I look forward to the days where I can sit on the couch and play with piper and take the dog for a walk. Those quit days bring me joy: I can pick up a flower or talk to a neighbor. The best things in life are simple. I work out 3 times a week, nothing strenuous, as long as I sweat on my forehead, I count that as working out. When I'm sweating, I get my best ideas, I'm more confident and I feel much better about myself. I also start my day with a shake so I'm not starving for lunch. I try not to over-eat for dinner. Portion control is everything. These little things have helped me with my muffin top and double chin. This is a must if you are a mom-boss. Don't overwhelm yourself. Life is too short and your kids grow up too fast. I started an associate program so I don't have to be at every shoot. There are many affordable daycares out there and you don't have to take your child everyday. It' way too hard to multi-task with a kid so get help. Be present for your kids, be present with your friends, family, clients. Show up. Life is a gift and make the most of it. Turn off your phone, instagram, facebook and live your best life.